A new video created by TGS to raise awareness of LGBT issues in Northern Ireland has received a response akin to that of first tasting marmite. The satirical video parody of the Northern Ireland 2012 advert “Our Time, Our Place” got a mixed response from The Gay Say fans on Facebook when it went live on Friday. Most people loved it, some of you hated it and others thought it was a tad tasteless. Hmmm… maybe the marmite analogy wasn’t quite as fitting as I’d thought. The twist on the Northern Ireland advertising video was made in response to a similar video created by residents in Indiana outraged by Governor Mike Pence’s decision to sign the state’s Religious Freedom Restoration Act into law at a private ceremony last month. The legislation is very similar to Paul Givan’s proposed conscience clause bill. The Indiana video went viral online raising a huge amount of much needed awareness. The conscience clause and the religious freedom act are both viewed as loopholes allowing businesses and services to discriminate freely against the LGBT community without legal consequences. Myself and others believe that these stories are pretty horrifying to read and see in the news, not only for the local people they affect but also for the worldwide community. With the advent of a world interconnected by social media on such a massive scale it doesn’t seem to take long for some of these comments to sweep across the globe. What kind of message does this send out about Northern Ireland as a nation? Will this present the idea that we are a friendly, inclusive nation who value and respect each other’s equality? Or will this reinforce the idea that NI is still a backwards den of intolerance, divisiveness and segregation? I fear that people will be swaying more in favor of the latter view considering this recent torrent of bad publicity. 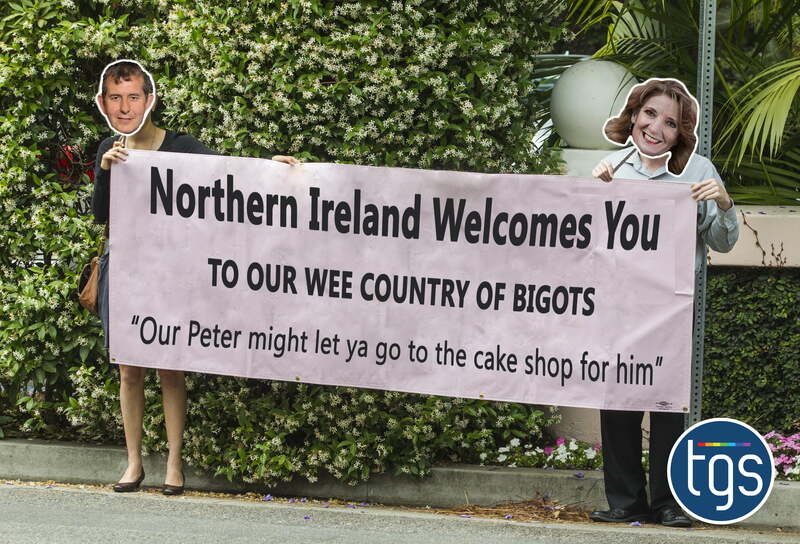 Based on the speeches and remarks from Northern Ireland’s more outspoken anti-lgbt+ politicians, groups and representatives it wouldn’t be unrealistic to think that some people will believe our politicians are making Northern Ireland a place where it is o.k to be a bigot. The consequences of this type of thinking are unbelievably and painfully far reaching on a regional, national and international scale. The Gay Say video merely condenses a lot of important issues into one short clip and a few people appear to have found it as hard hitting as a Northern Ireland road safety advertisement. However we feel it is a much needed summary and overview nonetheless because it highlights how this combination of news can affect perception. The unfortunate reality is that the issues in the video are only at the tip of the iceberg. The definition of a bigot refers to a person intolerant of those holding different opinions. Massive headway has been gained in terms of changing the opinion that bigotry is a thing of the past in Northern Ireland but there are clearly many people stuck in that past. Oh can no one enjoy satire anymore? I feel like there must be two videos here for people who are looking for an issue. I definitely didn’t get the impression that the video wanted to portray NI as an exception.